As the weather gets (slightly) better week by week its got me thinking about how I want to get our garden looking a bit more fancy and make it into a more useable space. At the moment all we have out in the back garden is some decking, a few plant pots and some slightly uncomfortable garden chairs. Next week my parents are coming to see me to help me plan out how to make the garden a bit more private as, at the moment, when I hang my washing out, I feel like the whole neighbourhood can see my smalls! So, once we've tackled the issue of getting some higher fencing up its all about the sprucing it up with garden furniture and accessories! I've always wanted a nice comfy outdoor sofa, the one in the collage above looks perfect.. I'd so get myself comfy on the right hand chair and use that footstool to make it into a lounger. I'd kick back on it on lazy Saturday afternoons and drink a nice cooling summer mocktail. The cushions on this Fishpools seating set are designed to be on the rattan seats all year round too so no having to pack them away at the end of a relaxing sesh. Come the evening time I'd love to have the Chiminea blazing away to keep us cosy whilst snuggled up under a blanket. The parasol I've included has built in LED lights, I bet it would look so perfect! On the grey plant stand I'd have a selection of succulents and terrariums and possibly some strawberry plants. Of course, no garden set up would be complete without a few cute lighting accessories- above I've pulled together some of my faves. 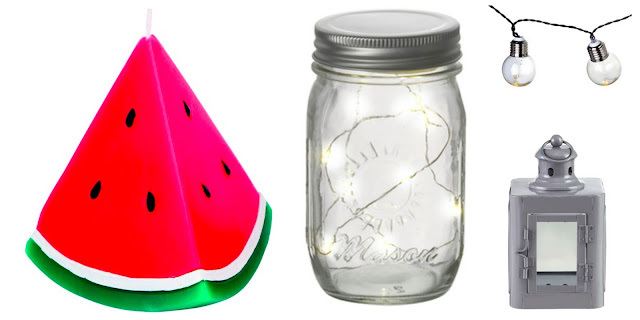 I'd have the watermelon candle and the jar on table of the sofa set. The garland lights wrapped around the stand of the parasol and the lantern on the decking near the sofa set too. I love eating outdoors in the summer time so I'd choose the rather bright, slightly mismatching collection of stuff above to give the over all set up a pop of colour. The cutlery caddy looks super handy to save repeat trips indoors to collect napkins and serving spoons! I'd really like to get the garden looking great and being a more useable space over the next month or so; I think its a shame to essentially have another room to the house that we rarely use.. lets just hope the weather gets a bit nicer come July! 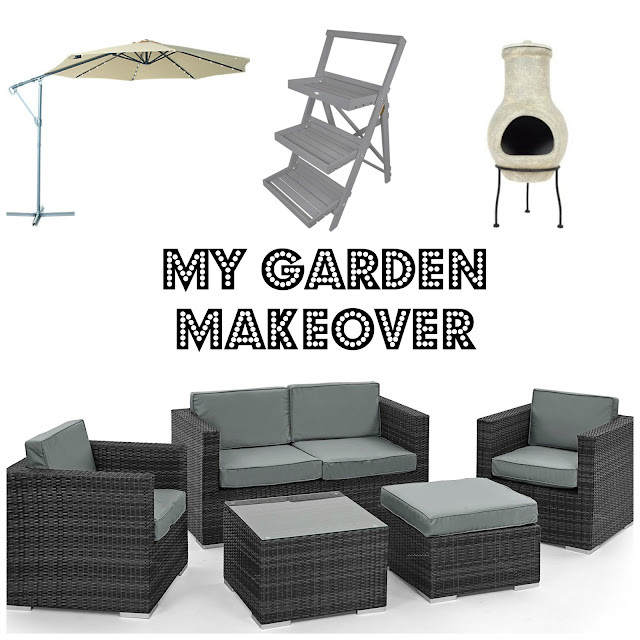 Are you planning on giving your garden a makeover this summer? Which piece from the collages would you choose? Ooh lovely post Holly, I love the plant stand and the bug tray! !